Lower left: "J. Sorolla 1910"
Handsome and proud, Pepilla sits with one arm around her daughter's shoulders and her other hand on her hip. Both mother and daughter gaze directly out at the viewer. 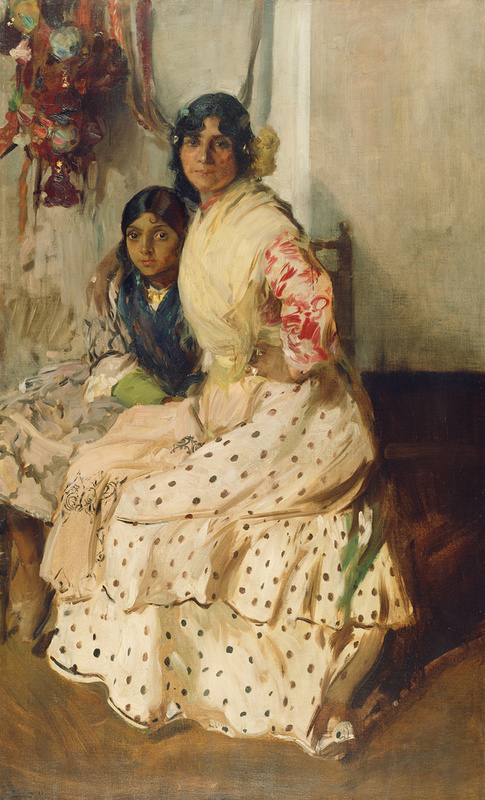 Just as the mother's gesture tenderly protects yet presents her daughter, Joaquín Sorolla y Bastida expressed tenderness in his portraits of Spanish people, particularly women and children. With his typical spontaneous, broad brushwork, Sorolla reveled in the effects of the warm Mediterranean light and air on the colors and patterns in the women's costumes. He preferred to paint even portraits outdoors, trying to achieve a spontaneous effect. "[N]o matter how much labor you may have expended on the canvas, the result should look as if it had all been done with ease and at a sitting," he said in 1909. Thomas Fortune Ryan, 1851 - 1928 (New York, New York), purchased from the artist, 1911; upon his death, held in trust by the estate. Catalogue of Paintings by Joaquín Sorolla y Bastida under the Management of the Hispanic Society of America, February 14 to March 12, 1911, exh. cat. (Chicago: The Art Institute of Chicago, 1911), no. 5. A Collection of Oil Paintings by Joaquín Sorolla y Bastida, under the Auspices of the Hispanic Society of America, exh. cat. (St. Louis: City Art Museum, 1911), p. 29, no. 5. American Art Association, New York. Gothic and Renaissance Art: Collection of the Late Thomas Fortune Ryan. November 23-25, 1933, p. 89, lot 281. Pantorba, Bernardino de. La vida y la obra de Joaquín Sorolla: Estudio biográfico y crítico (Madrid: Editorial Mayfe, 1953), p. 189, no. 1732. Getty, J. Paul, and Ethel Le Vane. Collector's Choice: The Chronicle of an Artistic Odyssey through Europe (London: W. H. Allen, 1955), p. 162. Getty, J. Paul. The Joys of Collecting (New York: Hawthorn Books, Inc., 1965), pp. 14-15, 28. Pantorba, Bernardino de. La vida y la obra de Joaquín Sorolla. 2nd ed., rev. (Madrid: Extensa, 1970), p. 195, no. 1732. Jaffé, David. Summary Catalogue of European Paintings in the J. Paul Getty Museum (Los Angeles: J. Paul Getty Museum, 1997), p. 120, ill.
Roglán, Mark, et al. Prelude to Spanish Modernism: Fortuny to Picasso / Preludio al modernismo español: De Fortuny a Picasso, exh. cat. (Albuquerque: The Albuquerque Museum, 2005), pp. 220-21, no. 47, ill., entry by Mark Roglán. Pons-Sorolla, Blanca. "Preparing the 1911 Exhibitions." In Sorolla and America, exh. cat. Blanca Pons-Sorolla and Mark A. Roglán, eds. (Dallas: Meadows Museum, 2013), pp. 32-33, fig. 12. Pons-Sorolla, Blanca. "Sorolla's Other American Patron: Thomas Fortune Ryan." In Sorolla and America, exh. cat. Blanca Pons-Sorolla and Mark A. Roglán, eds. (Dallas: Meadows Museum, 2013), p. 203. Pons-Sorolla, Blanca. "Chronology." In Sorolla and America, exh. cat. Blanca Pons-Sorolla and Mark A. Roglán, eds. (Dallas: Meadows Museum, 2013), p. 295. Pons-Sorolla, Blanca. "Paintings Sold and Portraits Painted in America, and Portraits Painted in France for Americans: Not Included in the Exhibition." In Sorolla and America, exh. cat. Blanca Pons-Sorolla and Mark A. Roglán, eds. (Dallas: Meadows Museum, 2013), p. 313, no. 181, ill.
Roglán, Mark A. "Ryan and Sorolla: Rediscovering the Rich Life of an American Patron." In Sorolla and America, exh. cat. Blanca Pons-Sorolla and Mark A. Roglán, eds. (Dallas: Meadows Museum, 2013), pp. 76, 87n90. Velasquez, Roxana. "Sorolla and Hispanism in California." In Sorolla and America, exh. cat. Blanca Pons-Sorolla and Mark A. Roglán, eds. (Dallas: Meadows Museum, 2013), p. 111. Pons-Sorolla, Blanca. "Preparando las exposiciones de 1911." In Sorolla y Estados Unidos, exh. cat. Blanca Pons-Sorolla and Mark A. Roglán, eds. (Madrid: Fundación Maphre, 2014), pp. 36-37, fig. 17. Roglán, Mark A. "Ryan y Sorolla: Semblanza de un mecenas estadounidense." In Sorolla y Estados Unidos, exh. cat. Blanca Pons-Sorolla and Mark A. Roglán, eds. (Madrid: Fundación Maphre, 2014), pp. 87, 100n90. Velasquez, Roxana. "Sorolla y el hispanismo de California." In Sorolla y Estados Unidos, exh. cat. Blanca Pons-Sorolla and Mark A. Roglán, eds. (Madrid: Fundación Maphre, 2014), p. 132. Pons-Sorolla, Blanca. "Introducción." In Sorolla y Estados Unidos, exh. cat. Blanca Pons-Sorolla and Mark A. Roglán, eds. (Madrid: Fundación Maphre, 2014), p. 186. Pons-Sorolla, Blanca. "Cronología." In Sorolla y Estados Unidos, exh. cat. Blanca Pons-Sorolla and Mark A. Roglán, eds. (Madrid: Fundación Maphre, 2014), p. 345. Pons-Sorolla, Blanca. "Obra de Sorolla vinculada a Estados Unidos no incluida en la exposición." In Sorolla y Estados Unidos, exh. cat. Blanca Pons-Sorolla and Mark A. Roglán, eds. (Madrid: Fundación Maphre, 2014), p. 358, ill.